When the mentors and industry people who came to talk to us about Critical Hit told us that our game would change every week, I didn’t believe them – or, more accurately, I didn’t want to believe them. I should have guessed that they were right, since in the first week alone the game changed drastically at least three times. Naturally, what they predicted is exactly what’s happening. Thankfully, we haven’t abandoned anything that spoke to us metaphorically or ideologically: the changes that we’ve made have continually been to narrow our focus, to make something that we will be able to complete in the remaining five and a half weeks of Critical Hit. Luckily, the art assets haven’t changed all that much since we’ve kept the kinds of objects in the game consistent, so Andy has still been able to plug away, creating awesome and funny animations for us. Also, as I’ve probably mentioned, Charlotte is a speed demon when it comes to prototyping – she is able to get at the core of what is essential to testing a mechanic with no bells and whistles (that’s my job as the sound person later on). We have also had an amazing support team in the form of just about everyone at Critical Hit and all the amazing mentors that have been brought in. It isn’t always easy to hear how your game is really great conceptually but that you’ll never be able to make and polish all those amazing mechanics in the time remaining, but we’ve tried to balance not being swayed by every single thing that everyone says with taking good advice when we hear it. I don’t even know if I should describe the current version of the game at all since who knows when things might change again, but I think it’s a worthwhile exercise and it’ll be nice to have this to look back on, so here goes. We’ve dispensed with body types in that we’ve combined the body types with the items that we had representing our stereotypes: Rosie can now wield a vacuum cleaner to take items through subterranean mazes, and once she’s acquired those, she can carry them in her inventory, which is the baby carriage. In the mazes are items that she can use for different purposes: the red light, which lets her examine dark areas and read hidden text, the briefcase, which she can use to break through glass obstacles (ceilings, shall we say? ), and blocks, which come as circles, squares and triangles, and are placed in different configurations to complete puzzles. From the maze, she can also acquire a very shiny bikini, which causes other zombies to follow her. Other than that, there will be other objects in the maze that help and hinder and refer to different metaphors. Rosie is still looking for brains and other zombies still give her a piece of their mind, which she can return with interest. 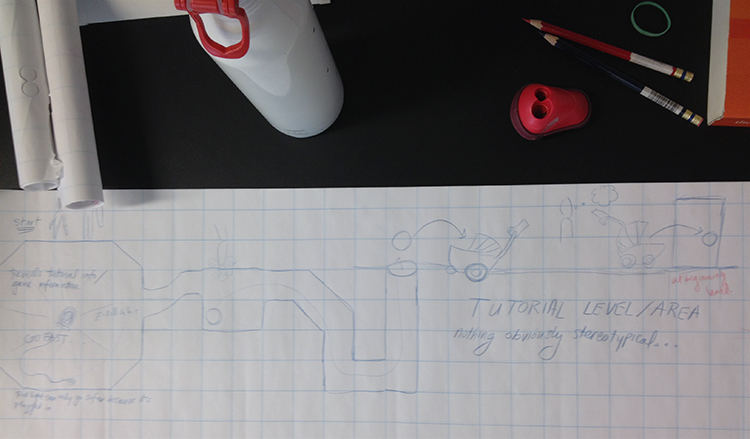 So, if you were to stop by today, you’d be able to see some of Andy’s great animations and concept art, some of our prototypes for the puzzles from Charlotte, and some good ol’ fashioned paper map level design from me. Here’s a picture.